We review the numerous experimental studies dedicated to unravelling the physics and dynamics of various parts of a volcanic plumbing system. Section 1 lists the model materials commonly used for model magmas or model rocks. 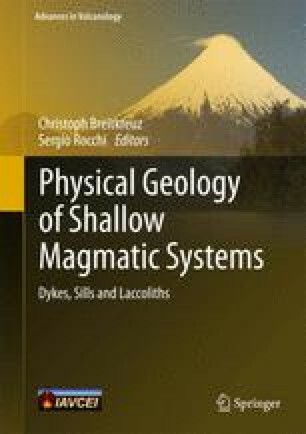 We describe these materials’ mechanical properties and discuss their suitability for modelling sub-volcanic processes. Section 2 examines the fundamental concepts of dimensional analysis and similarity in laboratory modelling. We provide a step-by-step explanation of how to apply dimensional analysis to laboratory models in order to identify fundamental physical laws that govern the modelled processes in dimensionless (i.e. scale independent) form. Section 3 summarises and discusses the past applications of laboratory models to understand numerous features of volcanic plumbing systems. These include: dykes, cone sheets, sills, laccoliths, caldera-related structures, ground deformation, magma/fault interactions, and explosive vents. We outline how laboratory models have yielded insights into the main geometric and mechanical controls on the development of each part of the volcanic plumbing system. We conclude with some perspectives on the limitations of past and current analogue modelling approaches, and on challenges to be addressed by future research.